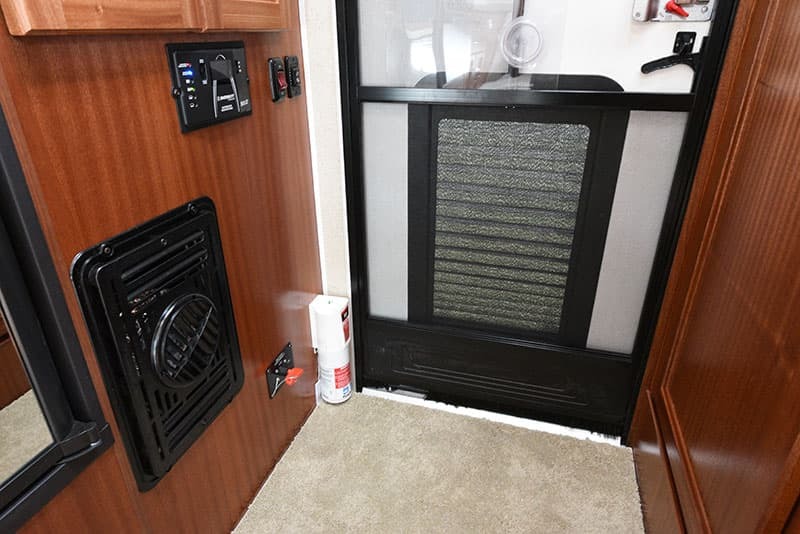 The only available options are a 9200 BTU Coleman Mach 8 air conditioner, boat rack, camo graphics, Thetford cassette toilet, gas/electric hot water heater, dually brackets, microwave, U-shape dinette, and 7300 remote controlled Fantastic Fan. Most of the Special Editions on dealer lots will have the air conditioner, gas/electric hot water heater, and microwave. 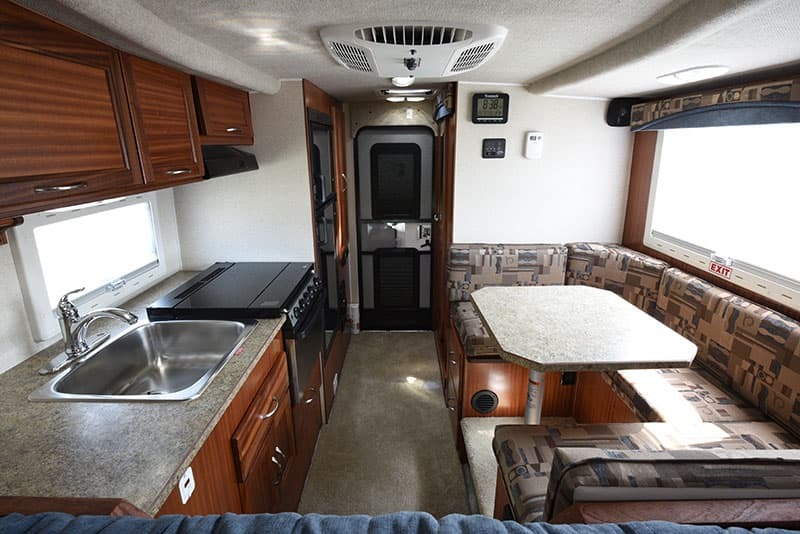 Needless to say, Northern Lite’s Special Editions campers come brimming with luxury features. 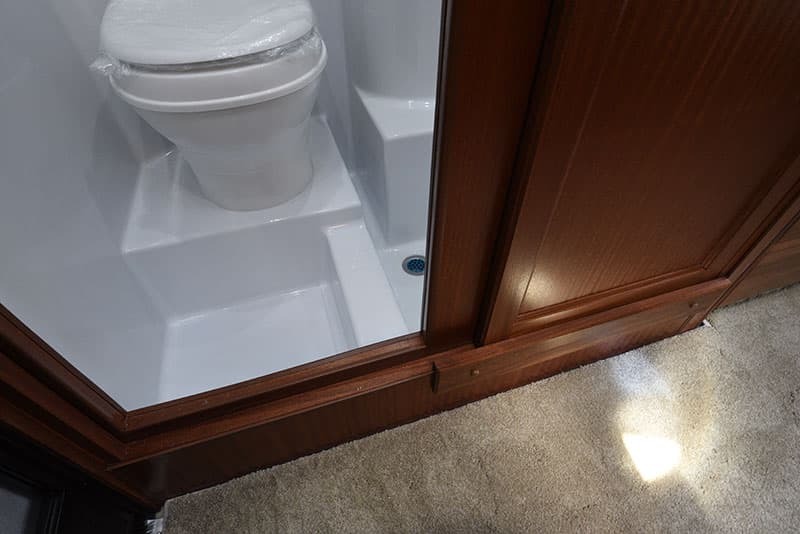 The main differences between these two campers is (a) dry bath versus wet bath, (b) some additional counter space and storage afforded by the longer 8-11 EX molds, and (c) a better truck fit and aesthetic also built into the new 8-11 EX molds. Other than the dry bath versus wet bath, most of these differences might not be obvious unless the two campers were literally side-by-side, and someone pointed them out. The 8-11 EX is 125 pounds heavier and 4-inches longer than the 8-11. This is probably not enough weight or length to tip someone one way or the other, unless their truck is right there with the payload. Sometimes 125 pounds can make the difference between a good match, and one that’s over. As a reviewer, I want to make more of the differences between these two models, but that’s essentially it. The 8-11 was already a highly refined truck camper, so it’s hard to fault Northern Lite for maintaining what works so well in the new 8-11 EX model. The layout is identical. The materials are identical. If all you saw was the main interior space of these two units, it would be darn near impossible to tell them apart. So the 8-11 versus 8-11 EX battle really comes down to the 8-11 wet bath design versus 8-11 EX dry bath design. If you’re looking at these two models, I can almost 100-percent guarantee your decision will be made depending on which of these two bathrooms you prefer. Immediately inside the rear entry door is the battery disconnect switch. This is the perfect location for this vital feature. Together with the standard 95-watt solar panel, the battery disconnect allows you to preserve the batteries when the camper is not being used. As long as the solar panel has sufficient sunlight, your batteries should be ready to camp. While we’re here, we should all be checking the status of our fire extinguishers. 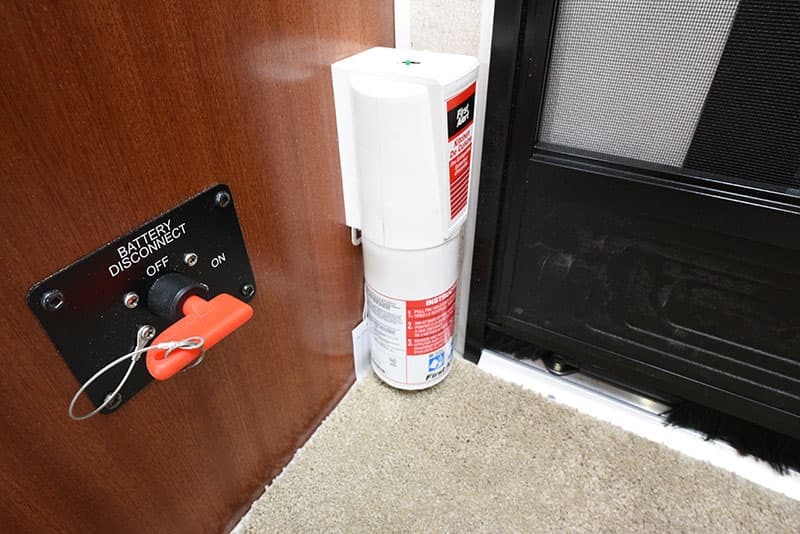 The fire extinguisher shown in this photo is exactly the same make and model that’s in our 2004 Alpenlite truck camper. The date on our original extinguisher reads 2003. According to the experts we have talked to, extinguishers need to be replaced every 12 years, or sooner. We are over due and ordering a new one now. 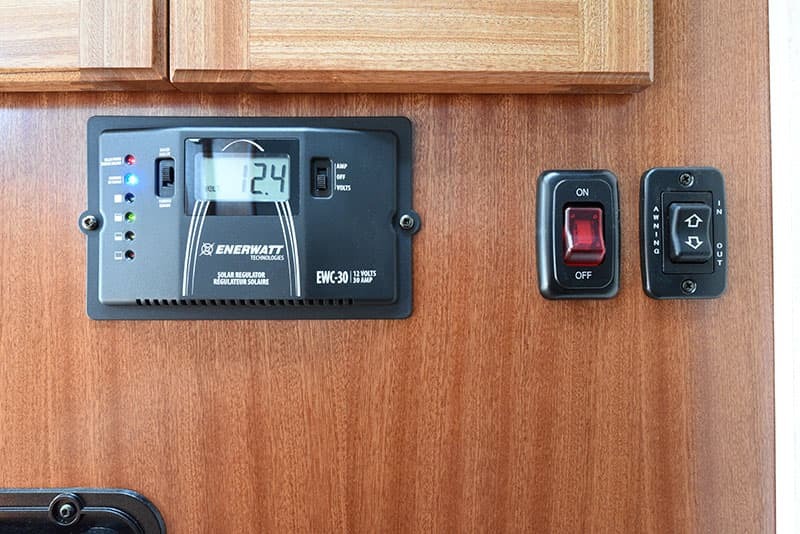 Right above the battery disconnect switch is the standard Enerwatt EWC-30 solar controller, a light switch, and the power awning rocker. Again, the locations for these features is excellent, as is the quality of the installation. The black components are well matched, lined up, and solidly mounted. Even the bottom of the closet doors above are perfectly lined up and installed. This is the kind of quality and precision we have come to expect – and love – from Northern Lite. The back door has a lower window (shown here with the black out privacy shade closed). With the shade open, this window lines up with the pass-through window on the front wall, which lines up with the rear view mirror of your truck. When driving, you can literally see straight through the camper to the traffic behind you. In the days before rear view cameras and slide-outs, this is how folks saw out the back of their truck camper rigs. We first experienced this feature in a 2004 Lance 1030. From the driver’s seat we could see cars behind our unit, and headlights at night. This is another reason why we still prefer non-slide truck camper designs.